From top to bottom, the Casio XW-P1 and XW-G1. 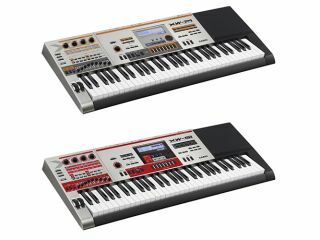 NAMM 2012: We already knew that Casio had the XW-P1 performance synth on the way, but it turns out that this is only half the story, for it's also launching the XW-P1 groove synth at the show. Details and specs for each are below, and we'll have video as soon as possible. The Casio XW-P1 will be available in late March and the XW-G1 will arrive in April. The XW-P1 is a true performance synthesizer that allows users to create a wide array of sounds from many preset tones, including Solo Synthesizer, Hex Layer, and Drawbar Organ tones, as well as numerous types of internal PCM and Synth waves. The unit is also loaded with a full range of functions that are useful for live performances. Weighing only 5.4 kilograms and with a slimly designed body, the XW-P1 can be powered with dry cell batteries, making it possible to be played in a wide range of live settings—from the stage to the street. The XW-G1 is a groove synthesizer equipped with a keyboard and loaded with the functions of the　various kinds of digital equipment used by club DJs, including the ability to create and play back a variety of rhythm patterns and musical phrases, all in a single unit. Users can enjoy playing an all-in-one instrument that enables control of cool sounds via sets of nine sliders, 16 Step Sequencer buttons and four assignable knobs arranged on the left side of the top panel.